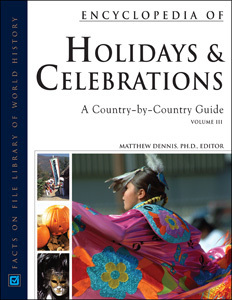 Encyclopedia of Holidays and Celebrations: A Country-by-Country Guide explores major holidays, festivals, and rites of passage in 206 countries. The first two volumes are organized alphabetically by country. The third volume features overview articles that provide detailed information about major holidays celebrated around the world, as well as articles on major world religions. Country entries include general information and a brief introduction, subsections on holidays, religious holidays, regional holidays, and rites of passage; origins and rituals; and further reading. Entries on internationally observed holidays include holidays in an international context, at-a-glance information, the dates of observance, an introduction to the religion, the origins and history, the way in which the community celebrates/commemorates the holiday, and further reading. Two hundred black-and-white photographs complement the text, along with numerous sidebars and callouts focusing on fun facts relating to specific holidays. Additional features include calendar systems around the world, regional maps, indexes by holidays and countries, and a comprehensive index. "...highly recommended for any library, high school, public, college, or university..."
"Certain to become the choice resource for any 'holiday' question..."
"Students, teachers, and librarians will delight in this encyclopedia...brings together a wealth of information on major holidays and festivals in 206 countries...coverage is broad and balanced...recommended for high-school and public library collections." "This three-volume set offers librarians easy access to a wealth of data and offers patrons a fun way to answer homework questions on all manner of issues relating to holidays and celebrations...extremely useful...The entire set is beautifully laid out with clear crisp text, nice graphics, black-and-white photographs, and an abundance of fun facts, further readings, maps, brief stories, and explanations pulled out into a mix of balloons, sidebars, and text boxes...This work is highly recommended for all libraries." "This accessible and comprehensive set offers more information than [the competition]..."
"Editors' Choice Reference Source, 2007"